Does God Need a Temple? Primitive religions are replete with examples of buildings and shrines as a house or shrine to an idol or a god. Animistic religionists believe that spirits live in trees, rocks, caves, or sacred groves. The Egyptians deified crocodiles, cats, cows, birds and beetles. The Greeks and Romans assigned to their gods splendid mansions and palaces as their dwelling places. "Men of Athens, I perceive that in every way you are very religious. For as I passed along, and observed the objects of your worship, I found also an altar with this inscription, `To an unknown god.' What therefore you worship as unknown, this I proclaim to you. The God who made the world and everything in it, being Lord of heaven and earth, does not live in shrines made by man, nor is he served by human hands, as though he needed anything, since he himself gives to all men life and breath and everything. The tabernacle, mishkan, is referred to 139 times in the Old Testament, primarily in Exodus and Numbers. 100 times it is referred to as the "dwelling place" of God! Incidentally, in the New Testament (1 Cor. 10, Hebrews 3,4) may be found specific references concerning the personal presence of Yeshua, the Son of God with His people in the wilderness. The Tabernacle gave tangible evidence that God was with His people as did the Pillar or Cloud by Day and the Pillar of Fire by Night (the Shekinah). When Solomon had ended his prayer, fire came down from heaven and consumed the burnt offering and the sacrifices, and the glory of the LORD filled the temple. And the priests could not enter the house of the LORD, because the glory of the LORD filled the LORD's house. When all the children of Israel saw the fire come down and the glory of the LORD upon the temple, they bowed down with their faces to the earth on the pavement, and worshiped and gave thanks to the LORD, saying, "For he is good, for his steadfast love endures for ever." Then the king and all the people offered sacrifice before the LORD. King Solomon offered as a sacrifice twenty-two thousand oxen and a hundred and twenty thousand sheep. So the king and all the people dedicated the house of God. The priests stood at their posts; the Levites also, with the instruments for music to the LORD which King David had made for giving thanks to the LORD ---for his steadfast love endures for ever---whenever David offered praises by their ministry; opposite them the priests sounded trumpets; and all Israel stood. And Solomon consecrated the middle of the court that was before the house of the LORD; for there he offered the burnt offering and the fat of the peace offerings, because the bronze altar Solomon had made could not hold the burnt offering and the cereal offering and the fat. At that time Solomon held the feast for seven days, and all Israel with him, a very great congregation, from the entrance of Hamath to the Brook of Egypt. And on the eighth day they held a solemn assembly; for they had kept the dedication of the altar seven days and the feast seven days. On the twenty-third day of the seventh month he sent the people away to their homes, joyful and glad of heart for the goodness that the LORD had shown to David and to Solomon and to Israel his people. Thus Solomon finished the house of the LORD and the king's house; all that Solomon had planned to do in the house of the LORD and in his own house he successfully accomplished. The downward course of spiritual and national life in ancient Israel from the time of Solomon to the Babylonian captivity is thoroughly described in the books of Samuel, Kings and Chronicles, as well as by the prophets, both major and minor. ...Then the king of Assyria invaded all the land and came to Samaria, and for three years he besieged it. In the ninth year of Hoshea the king of Assyria captured Samaria, and he carried the Israelites away to Assyria, and placed them in Halah, and on the Habor, the river of Gozan, and in the cities of the Medes. And this was so, because the people of Israel had sinned against the LORD their God, who had brought them up out of the land of Egypt from under the hand of Pharaoh king of Egypt, and had feared other gods and walked in the customs of the nations whom the LORD drove out before the people of Israel, and in the customs which the kings of Israel had introduced. And the people of Israel did secretly against the LORD their God things that were not right. They built for themselves high places at all their towns, from watchtower to fortified city; they set up for themselves pillars and Asherim on every high hill and under every green tree; and there they burned incense on all the high places, as the nations did whom the LORD carried away before them. And they did wicked things, provoking the LORD to anger, and they served idols, of which the LORD had said to them, "You shall not do this." Yet the LORD warned Israel and Judah by every prophet and every seer, saying, "Turn from your evil ways and keep my commandments and my statutes, in accordance with all the law which I commanded your fathers, and which I sent to you by my servants the prophets." But they would not listen, but were stubborn, as their fathers had been, who did not believe in the LORD their God. They despised his statutes, and his covenant that he made with their fathers, and the warnings which he gave them. They went after false idols, and became false, and they followed the nations that were round about them, concerning whom the LORD had commanded them that they should not do like them. And they forsook all the commandments of the LORD their God, and made for themselves molten images of two calves; and they made an Asherah, and worshiped all the host of heaven, and served Baal. And they burned their sons and their daughters as offerings, and used divination and sorcery, and sold themselves to do evil in the sight of the LORD, provoking him to anger. Therefore the LORD was very angry with Israel, and removed them out of his sight; none was left but the tribe of Judah only. Some of the events leading to the destruction of the Second Temple and the fall of Jerusalem on the 9th of Av in the year 586 BC are known from secular sources. The Assyrians who plundered and pillaged the ten Northern tribes, finally capturing the capital of Samaria in 722, had disappeared from power by 586 BC, (136 years later) exactly as foretold by prophets such as Isaiah who warned that the threat to Jerusalem would come from the rise of the new power known as Babylon. At that time Merodach-Baladan the son of Baladan, king of Babylon, sent envoys with letters and a present to Hezekiah; for he heard that Hezekiah had been sick. And Hezekiah welcomed them, and he showed them all his treasure house, the silver, the gold, the spices, the precious oil, his armory, all that was found in his storehouses; there was nothing in his house or in all his realm that Hezekiah did not show them. So modest was the Second Temple compared to the First that some of the old-timers who had left Jerusalem at the time of the captivity were deeply disappointed at the unimpressive, small, and unimportant temple the returning exiles were building. Encouraging them that their efforts would be blessed beyond all their expectations the prophet Haggai urged the people to finish the building and put it into service. In an amazing and far reaching prosperity the Lord declared that this Second Temple would not only come to be filled with gold and silver, but receive a higher honor than mere riches. It was into this Second Temple, enlarged and expanded by King Herod, that the Messiah himself, Jesus, Son of David would appear. In the seventh month, on the twenty-first day of the month, the word of the LORD came by Haggai the prophet, "Speak now to Zerubbabel the son of Shealtiel, governor of Judah, and to Joshua the son of Jehozadak, the high priest, and to all the remnant of the people, and say, `Who is left among you that saw this house in its former glory? How do you see it now? Is it not in your sight as nothing? Yet now take courage, O Zerubbabel, says the LORD; take courage, O Joshua, son of Jehozadak, the high priest; take courage, all you people of the land, says the LORD; work, for I am with you, says the LORD of hosts, according to the promise that I made you when you came out of Egypt. My Spirit abides among you; fear not. The New Testament opens with a four-fold announcement that the long-awaited Messiah has come. It was in the Second Jewish Temple that the month-old infant Jesus was dedicated by his parents (Luke 2:22-38). At the age of 12 at Passover, Jesus remained alone in the Temple apart from his parents in what was probably the equivalent of a Bar Mitzvah dedication to the Lord. It may have been at this age of accountability that Jesus first realized He was the promised messiah with a specific mission and calling to fulfill (Luke 2:39-52). That same week Jesus presented his disciples with a sweeping prophecy of the next two thousand years of history. He began by speaking of the approaching total destruction of the Second Temple, "Do you not see all these things? Assuredly I say to you, not one stone will be left here upon one another, that not be thrown down." Fulfilled literally and in detail by the total destruction of the temple during the siege of Titus in A.D. 70, this prophecy of Jesus has long since come to pass. No Jewish Temple has stood on the Temple Mount to this day. The emphasis in the New Testament after brief accounts of the early history of the church in Jerusalem in the Book of Acts shifts abruptly away from Jerusalem and Jewish community life. The temple in Jerusalem is no longer the central focus point for God's presence in the world. The New Testament's bold assertion that man is the dwelling place---the temple---of God begins with the announcement of the Apostle John that the Second Person of the godhead had now become a man and come down to earth as Immanuel---"God with us." The New Testament does not negate the re-establishment of stone and cedar temples in Jerusalem in the days to come. Indeed the existence of an actual, operating, consecrated and legitimate Jewish temple in Jerusalem is clearly implied by at least three passages of scripture in the New Testament. The Coming Temple in Jerusalem---The Third Temple---soon to be built is not the last word in temples. The Bible teaches that Messiah will Himself build a temple in Israel, though not actually in city of Jerusalem. This edifice is most likely the temple described in great detail in the closing chapters of Ezekiel. Quite likely Ezekiel's Temple will follow the destruction of the Third Temple in a great earthquake that closes the tribulation period. If so it can be properly called the "Fourth Temple." During the millennial reign of Messiah upon the earth, Yeshua will rule (Greek: shepherdize) the nations with a rod of iron. Believers will rule and reign with him. Yet sinners will continue to be born on the earth, and will each need to make a choice during their lifetimes to chose or reject God's rule in their hearts. During this thousand year reign of Christ on earth, believing Jews and Gentiles who have already received their resurrection bodies will be free to come and go upon the earth, though their home will likely be the New Jerusalem. Jewish Bible scholars at the Temple Institute in Jerusalem believe, even today, that the new temple(s) yet to be built in Jerusalem will not only be houses of worship and fellowship with the living God---the Holy One of Israel---but portals or gates into the heavenly realm. There remains yet much mystery as to the meaning of the Jewish tabernacle and temples with their precise measurements, strange appliances and rituals, all given by God according to a precise set of divine blueprints. What does God wish us to learn from all this? Some things are clear. Sinful men can not approach a holy God without a suitable sacrifice. The shedding of blood is somehow necessary to make atonement for human evil. Even forgiven sinners need washing and regular cleansing in order to enjoy fellowship with their Creator. No man can approach God directly without a proper Mediator. Men are weak and need not only a Savior, Kinsman-Redeemer (Goel), but a priest to intercede for them. The problem of human sin is deep, troublesome and persistent. Men sin against one another, against nature and above all against God. Yet God in His love wishes to teach us the depths of his love and forgiveness and mercy through the symbolism of the temple. The temple, therefore, is a picture for all time of man as in relationship with God, a picture of God as man intended him to be. Note Added: Josephus, Antiquities Book III, 6:4. "As for the inside, Moses parted its length into three partitions. At the distance of ten cubits from the most secret end, Moses placed four pillars, the workmanship of which was the very same with that of the rest; and they stood upon the like bases with them, each a small matter distant from his fellow. Now the room within those pillars was the most holy place; but the rest of the room was the tabernacle, which was open for the priests. 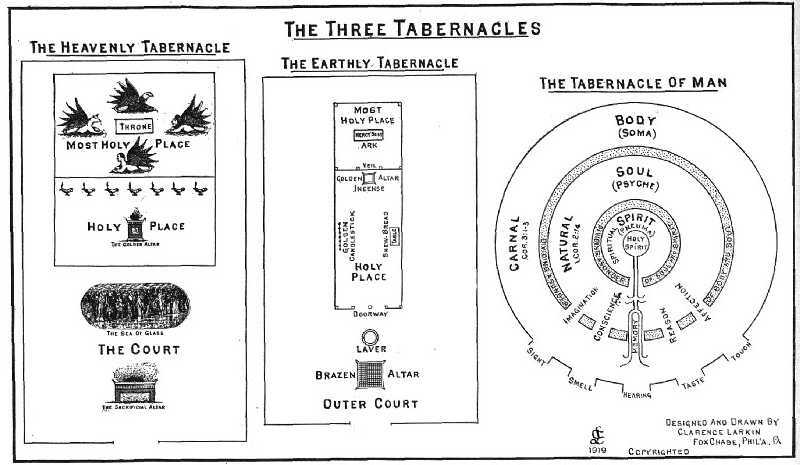 However, this proportion of the measures of the tabernacle proved to be an imitation of the system of the world; for that third part thereof which was within the four pillars, to which the priests were not admitted, is, as it were, a heaven peculiar to God. But the space of the twenty cubits, is, as it were, sea and land, on which men live, and so this part is peculiar to the priests only. But at the front, where the entrance was made, they placed pillars of gold, that stood on bases of brass, in number seven; but then they spread over the tabernacle veils of fine linen and purple, and blue, and scarlet colors, embroidered. The first veil was ten cubits every way, and this they spread over the pillars which parted the temple, and kept the most holy place concealed within; and this veil was that which made this part not visible to any. Now the whole temple was called The Holy Place: but that part which was within the four pillars, and to which none were admitted, was called The Holy of Holies. This veil was very ornamental, and embroidered with all sorts of flowers which the earth produces; and there were interwoven into it all sorts of variety that might be an ornament, excepting the forms of animals. Another veil there was which covered the five pillars that were at the entrance. It was like the former in its magnitude, and texture, and color; and at the corner of every pillar a ring retained it from the top downwards half the depth of the pillars, the other half affording an entrance for the priests, who crept under it. Over this there was a veil of linen, of the same largeness with the former: it was to be drawn this way or that way by cords, the rings of which, fixed to the texture of the veil, and to the cords also, were subservient to the drawing and undrawing of the veil, and to the fastening it at the corner, that then it might be no hindrance to the view of the sanctuary, especially on solemn days; but that on other days, and especially when the weather was inclined to snow, it might be expanded, and afford a covering to the veil of divers colors. Whence that custom of ours is derived, of having a fine linen veil, after the temple has been built, to be drawn over the entrances. But the ten other curtains were four cubits in breadth, and twenty-eight in length; and had golden clasps, in order to join the one curtain to the other, which was done so exactly that they seemed to be one entire curtain. These were spread over the temple, and covered all the top and parts of the walls, on the sides and behind, so far as within one cubit of the ground. There were other curtains of the same breadth with these, but one more in number, and longer, for they were thirty cubits long; but these were woven of hair, with the like subtilty as those of wool were made, and were extended loosely down to the ground, appearing like a triangular front and elevation at the gates, the eleventh curtain being used for this very purpose. There were also other curtains made of skins above these, which afforded covering and protection to those that were woven both in hot weather and when it rained. And great was the surprise of those who viewed these curtains at a distance, for they seemed not at all to differ from the color of the sky. But those that were made of hair and of skins, reached down in the same manner as did the veil at the gates, and kept off the heat of the sun, and what injury the rains might do. And after this manner was the tabernacle reared.